Insurance policies are intended to protect you and your dear ones at difficult times. A policy lapses when premium is not paid even after the grace period. Generally the grace period is thirty days from the first unpaid premium. A lapsed policy generally ceases to get the insurance coverage. Policy can be brought back to live condition by paying the premium along with the interest. But if the policy remains lapsed for more than six months from the due date, it has to be revived. Revival requires submission of Declaration of Good Health (DGH) along with premium and interest. A lapsed policy will not help the unfortunate family to tide over the difficult situation. Hence all efforts should be taken to see that all your insurance policies are fully in force all the time. 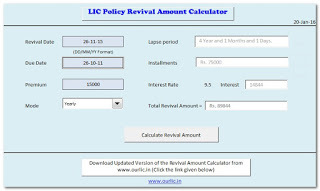 LIC Policy Revival Amount Calculator is a free software to calculate the amount required to revive your existing insurance policy which is in lapsed state. Revival Amount Calculator can be downloaded from here or from the the link provided at the bottom of this post. Generally you can revive your lapsed policy any time within five years from the date of last premium payment, subject to the condition that health of policy holder is good enough at the time of revival. Forms required to revive a lapsed insurance policy from LIC can be downloaded from here. All the premium dues and the interest accrued on the unpaid premium till the date of revival has to be paid as a single lump sum payment. A Declaration of Good Health and Identity proof has to be submitted along with the revival application. This is a special type of revival method applicable to policies with premium paid period less than three years and where lapsation period is not more than two years. Date of commencement is shifted in such a manner that premium dues need not be paid. The Maturity date of the policy also will be shifted accordingly. This method of revival is suitable for customers who are unable to pay the dues and interest but want to continue the policy. This type of revival method is applicable to money back policies where survival benefit payable is adjusted towards the premium dues and interest to be paid. Here a loan is raised from the policy after considering that all the premium is paid up to date and available loan after this consideration is used to pay the premium and interest dues. How to use LIC Policy Revival Amount Calculator? Download the software from the link provided at the bottom of this post. Remember to enable Macros in your Excel software when prompted to make this program work. If no such prompt is found please check the ‘macro’ security level of Excel and lower its level to medium. To read more on how to enable Macros and any help in this regard please click here. Please give the date of revival of the policy and the due date of the policy in the position provided. Select the Mode from Drop down menu and click the ‘Calculate Revival Amount Button’ to get revival amount. 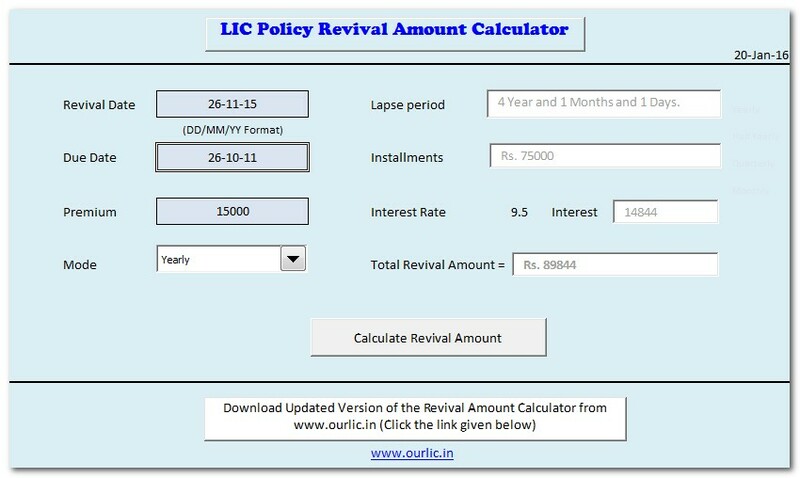 Download LIC Policy Revival Amount Calculator by clicking here. If you like this article and feel that it has to be shared please share it using links provided at the bottom. Your comments regarding this article or the software is also welcome. Download free Insurance Policy Premium and benefit Calculator for LIC. LIC’s ULIP Plan Endowment Plus Premium, Benefit and Charges Calculator. How to use LIC’s e Services to track your policies. LIC s Health Insurance policy- Jeevan Arogya- Premium and benefit calculator. We are very thankful to you for giving us a great free calculation sheet and many more things from your website. Sir, I wanted to know is there any other program for client record keeping? if yes please share the link or update it on your website.